Intentional pneumoperitoneum has been used by the author to prepare several patients for an urgent laparotomy. Each patient previously had undergone between 5 and 12 abdominal surgeries. 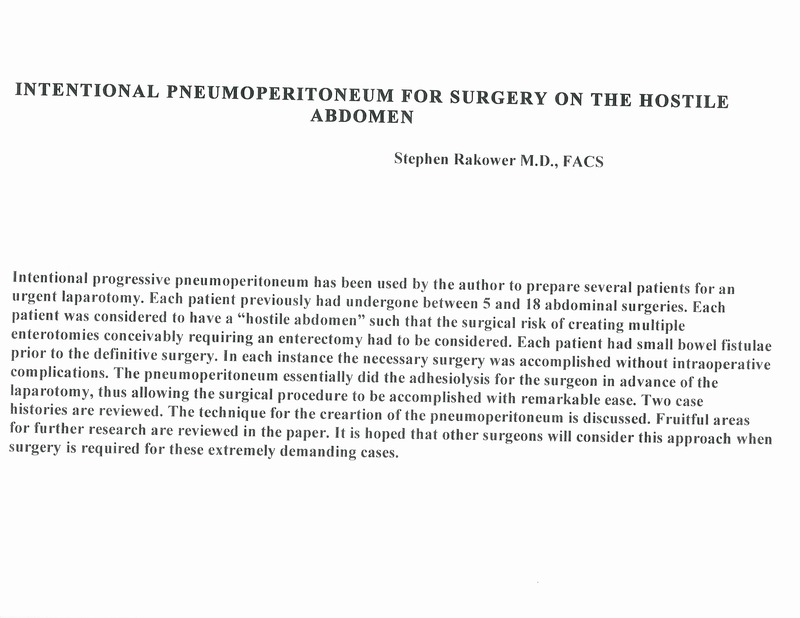 Each patient was considered to have a “hostile abdomen” such that the surgical risk of creating multiple enterotomies conceivably requiring an enterectomy had to be considered. Each patient had small bowel fistulae prior to the definitve surgery. In each instance the necessary surgery was accomplished without intraoperative complications. The pneumoperitoneum essentially did the adhesiolysis for the surgeon in advance of the laparotomy, thus allowing the surgical procedure to be accomplished with remarkable ease. The case histories are reviewed. The technique for the creation of the pneumoperitoneum is discussed. Fruitful areas for further research are reviewed in the paper. It is hoped that other surgeons will consider this approach when surgery is required for these extremely demanding cases.